A tip of the hat to the Navy and its Facebook notifications for the reminder that today marked the 50th anniversary of an event frozen in the minds of many Americans of a (ahem!) certain age: the day Navy Cmdr. 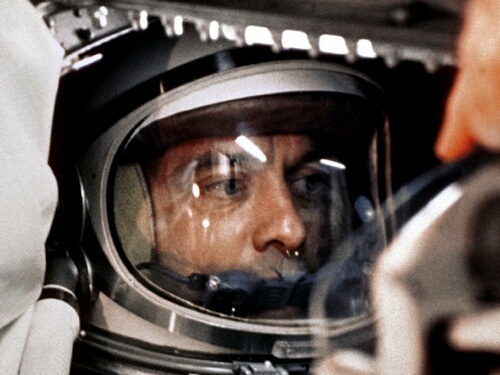 Alan Shepard became the first American launched into space. His feat captivated the nation, and won back some American pride bruised by Soviet cosmonaut Yuri Gagarin beating him into space by 23 days. The Naval Academy grad and jet test pilot had in 1959 become one of the original Mercury astronauts — the guys with the “Right Stuff,” as Tom Wolfe framed it — and on the morning of May 5, 1961, Shepard, squeezed inside the Freedom 7 space capsule and propelled by a Redstone booster, rocketed 116.5 miles into outer space. Shepard’s flight only lasted 15 minutes, 28 seconds. Shepard’s career as an astronaut wasn’t over. An ear problem that grounded him in 1964 was surgically repaired five years later and in February 1971, Shepard commanded the Apollo 14 mission to the moon. He retired as a rear admiral in 1974. The National Aeronautics and Space Administration today honored Shepard, who died in 1998 at the age of 74, during a ceremony at Cape Canaveral, Fla., where Freedom 7 was launched 50 years earlier. The U.S. Postal Service also issued a new stamp May 4 honoring Shepard’s 1961 achievement. My new favorit candidate to be honored with a US Navy ship, perhaps even CVN-79? Fair winds and following seas, Alan Shepard!